Rod Abernethy returns to his folk roots after an award winning career as a composer. With clear, honest vocals backed by soulful acoustic guitar, Rod delivers a double album of powerful southern folk, telling his stories of love, family and tradition. 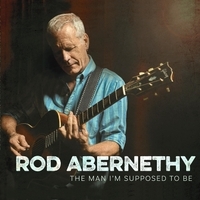 A master acoustic guitarist and powerful singer, Rod Abernethy’s THE MAN I’M SUPPOSED TO BE is a tour de force for this multi-talented singer/artist. An award-winning soundtrack composer for film, TV and video games, Rod returns to his early roots writing both songs and instrumentals that harken back to his folk artist days. In this double release, Abernethy delivers performances with an urgent sincerity about living in North Carolina and the Deep South, backed by his soulful and sometimes whimsical guitar work. Disc One is a collection of original songs revolving around family, friends and places across his home state of North Carolina, as well as Rod’s versions of Alexi Murdoch’s “All My Days” and BJ Barham’s “The Man I’m Supposed To Be”. "The Bucket Song", co-written with Nashville veteran songwriter/producer Wyatt Easterling, showcases Rod's whimsical, acoustic guitar breakdown style. On "Carolina Roads", Rod tells the story of his journey to the west in search of success only to find that success back home in North Carolina. "How To Forget" showcases Rod's craft of writing songs that are personal and speak to the global message of love and forgiveness. With "Pleasant Street", Rod paints a melodic, relaxing landscape of an ocean side where it's easier to let the pressures of life go and just relax in the moment. Disc Two is a guitar instrumental collection with Rod performing both 6- and 12-string guitar in the styles of Leo Kottke, John Fahey, Michael Hedges and Tommy Emmanuel. Also included is Rod’s guitar instrumental version of the 60’s hit “Walk Away Renee” by the Left Banke. "Hopscotch" hints of Kottke with a melody reminiscent of Emmanuel. "Catch That Frog" is a playful percussive track jumping in all sorts of directions -- melodically and rhythmically. And "Lucky Seven" marries the 12-string power and catchy melodic style of Kottke with Rod's expert slide playing. Rod collaborated with legendary producer Don Dixon (REM, Marti Jones, The Smithereens, Marshall Crenshaw) recording the basic tracks at Buddha View Studios in Charlotte, NC. All tracks were mixed by Rod at 1101 Studios in Raleigh, NC and produced by Rod, Dixon and Kari Estrin. Star performances include John Teer of Chatham County Line on mandolin, Joe Newberry on banjo, Caitlin Cary and Susan Cattaneo providing background vocals, and Pattie Kinlaw Hopkins of Hank, Pattie and The Current on filddle.